A guide to theatre resources at the UNLV Libraries. Play scripts and scholarly works from Faber and Faber and Bloomsbury's Methuen Drama and Arden Shakespeare imprints. Reference texts in American theater, as well as images of posters, playbills, photos, architectural images, floor plans, and other ephemera. Streaming video of theatre productions. The following resources provide background information on playwrights and related theatre topics. They are a great place to start your research and will help you explore and focus possible topics. This resource includes dictionaries, specialized encyclopedias, quotations, thesauri, and bilingual dictionaries. Reference texts in American theater, as well as images of posters, playbills, photos, architectural images, floor plans, and other ephemera. This collection also allows cross-searching of the full text contents of five online full-text drama collections: Black Drama, Twentieth Century North American Drama, Asian American Drama, Latino Literature, and North American Women's Drama. Some of the numerous topics covered are equipment, methods, concepts, design process, electricity, characteristics of light, and lightboard operations. Where applicable, entries present both the historical and current day significance of the apparatus or concept being introduced. In addition, the many areas of stage lighting that elicit debate are viewed from all angles and the various options presented. Now, the acclaimed Encyclopedia of Musical Theatre -- a 1994 Dartmouth Medal honorable mention -- has been fully revised and updated to document such developments with 500 new articles, more than 4,000 revised articles and dozens of color photos. From the dawn of operetta in the 18th century to the present, this set offers an unrivaled amount of information on the people, the songs and shows in America and around the world. A Dictionary of Theatre Anthropology subtly juxtaposes the visual demonstrations of the performers craft, from a wealth of Oriental and Occidental sources. Whereas most Western research is concerned with naturalism and psychological realism in acting, the Dictionary focuses on the performer's arduous and eclectic craft. More than just a dictionary, however, this is a handbook for theatre practitioners and a guide for students and scholars of transcultural performance. 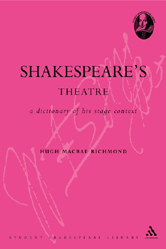 The International Dictionary of Theatre is a three-volume work, international and historical in scope, covering the theatre from the festivals of ancient Greece to the productions, plays, players, directors and designers of the modern stage. The 3 volumes comprise 1500 entries, selected by an international advisory board.